Ever since morning sickness hit about 9 months ago, I gave up on exercise. I did try for a few weeks during the second trimester, but then I was sick and we moved all at the same time, and by the time I recovered from both, I couldn’t keep up with it, mostly because of issues with my hips. I’m more of a exercise video person, but I do okay with a list of moves to do on my own. I found a really great program that I used for a while (before the move). It was a Fit and Healthy Pregnancy program. I didn’t go along with much of the diet part of the program, but the exercise portion seemed well rounded. For someone who doesn’t enjoy exercise videos, this would probably be a great fit. I put into my schedule a half hour of exercise before the baby wakes up to eat. If I exercise before my devotional time, I am more alert and able to focus. But this morning was the first morning I actually got up and did exercises–partly because I was already awake and figured I might as well be doing something. So I’m buying a postnatal exercise routine that I will use to supplement the exercises my physical therapist gave me. I’ll let you know how that goes later on. Ultimately, I would like to be able to work back up to P90X, which I was doing when I got pregnant and quit when morning sickness arrived. Of course, I’ll have to find an hour for exercise, instead of just a half hour. I’ll probably get one of Beachbody’s easier programs first, like Slim in 6, which would probably be a step or two above what I am doing now, but not near the intensity of P90X. I miss how great I felt when I was doing that program! What about you? Have you been exercising? Wish you could get back into it? Can’t find the time? Doing a program you love? Tell me about it! Hopefully I can be consistent with it! A clean home gives you many benefits, the best one being a great stress reliever. After a long day at work, wouldn’t it be nice to go home to a clean and organized house where everything you need is at the right place? Spring is the perfect time to clear your home of all the clutter and chaos. This doesn’t mean you have to throw out everything, though. Here are some green solutions you can try during your spring clean this year. The best way to go about spring cleaning is to dispose items that you no longer use. These can be empty lotion and shampoo containers, clothes that no longer fit, or maybe the really old toys that you loved as a child. In order to do this, you must have the heart to let go of the stuff you’ve been keeping for a long time. Springtime is a season of growth and change, so allow yourself to move on and let go. Go through all your belongings and sort out the ones you want to donate, recycle, and discard. Bring out the items that you know you will be able to use often and keep the things that you only use once in a while in a box. Label each box accordingly. By doing so, you will be making your life a lot easier. Decide which ones need to make their way to the garbage and which ones you can still use. Group the other items into things you can reuse or recycle and stuff you can donate to charity. Find clothes you haven’t used in months and give it to someone you know will benefit from it more. Remember that the lighter your home feels, the better your life will be. There will always be stuff that you’d be too embarrassed to donate, like tattered clothing and lone socks. Instead of throwing these out, use them as cleaning rags. Old shirts and towels make good cleaning cloths so don’t waste your money buying new rags when you already have good ones at home. Your old toothbrush is also another item you can recycle. Use it to clean your faucet and bathroom sink as well as your shower and toilet. If you are going to use one brush for everything, make the toilet its last destination to avoid contamination. Houses may be home to the most toxic products that could compromise human health in the long run. Now that you’re in the mood for cleaning, check areas that need extra attention such as medicine cabinets and the refrigerator. Collect all your medicines and throw out the expired ones. You can also bring them to your local pharmacy and they’ll take care of the disposal. If you’ve accumulated lawn care products and pesticides that haven’t been used in years, it’s definitely time to get rid of them. These types of wastes are labelled as Household Hazardous Waste (HHW) and most states require that they’re properly discarded. Find facilities in your locality where you can drop off hazardous for proper disposal. Spring cleaning is not just about de-cluttering your home but also renewing your connection with nature. Freshen up your home by including the garden in your clean-up. If you don’t have a garden, now is the best time to start one! Being eco-friendly means being one with nature as well as taking care of it. It can be a small plot in your backyard or a container garden for your kitchen. Use old ceramic pots or empty mason jars to plan herbs and spices. Meanwhile, you can use expired food items and vegetable or fruit peelings as fertilizer. Gardening offers you lots of benefits like having your very own source of flowers, fruits and vegetables. Furthermore, you actually burn calories from 45 minutes of gardening as with a 30-minute aerobic workout. All that fresh air and nature’s scent will do wonders for your health and well-being. With these eco-friendly ideas in mind, you’re well on your way to reaping the benefits of a healthy earth and home. Happy (green) spring cleaning! This guest post has a lot of good ideas on healthy sleep habits. Feel free to share any comments you might have–especially suggestions that are not listed here! It is important to keep a consistently maintained sleep schedule throughout the week, irrespective of weekends and holidays. This will enable their body to work in a particular manner. This way, their body will automatically tell them when it is time to sleep and when it is time to wake up without any fuss whatsoever. Try to incorporate some kind of physical activity in your kid’s daily planner. Not only will it make them healthy and alert but will also go a long way in their well-being. It is important that the kid’s do not sleep on an empty stomach. Try to keep the dinner ready and prepared well in time. In times when dinner is not done, then give them some cereals, milk or a fruit before putting them to bed. Also, make sure that dinner is eaten at least two hours before bedtime. Avoid foods that contain caffeine in the evenings as it can interfere with their sleep. So chocolates, iced teas, colas and coffee should be a definite no-no for the evenings! Try to plan your evenings so that you can tuck your kids in bed an hour before lights are off. This will give them an hour of doing fun activities, reading a book, playing or listening to songs before settling off to sleep. It is important for the kids to feel safe in the room, so do make it comfortable to them in terms of buying a good night light for their room. Try to avoid putting in a TV set in the kid’s bedroom. Kids get distracted easily and their excitement for watching television might make it difficult for them to sleep. If you have to discipline a child, try to avoid using the bedroom for time outs as the kids will associate it with negative things. Try to increase the positive aspects about their bedroom. It is important to give the kids a feeling of warmth and love – so do give them the kiss and hug before tucking them in bed. As kids grow older, they refuse to sleep on time if they have napped in the afternoon. So, if you have a kid who is five or older – then try to avoid letting them nap in the afternoon so that they can sleep on time. Ellen is a blogger by profession. She loves writing on latest technologies. These days she is busy in writing an article on Headphones iPod dock. Beside this she loves reading. She recently bought a Wireless Media Player from a fare. The last thing any expecting mom feels like doing while pregnant is hitting the gym, especially if it involves lifting weights. But, what every mom-to-be should know is that there is no need to go crazy in the gym to stay fit, maintain a healthy pregnancy weight, and keep your baby healthy. A simple weight training program and a healthy diet can do so much to make you look and feel great during pregnancy, and after your bundle of joy greets the world. Just make sure to consult your doctor before starting any kind of exercise program to find the best plan for you. Lifting weights is such a huge part of staying fit because it helps regulate your metabolism, and there is no better time to keep your metabolism even than during a pregnancy. Your metabolism is the clock in your body that decides whether to burn energy or store it as fat. If you maintain an active metabolism during pregnancy, it will be easier to lose the weight after your baby is born. The more muscle you have, the higher your metabolism will be, and the higher your metabolism, the easier it is to keep weight off. Building muscle is, believe it or not, the best way to burn fat. Now, it’s very important to have enough fat on your body while pregnant, because both you and your baby need it to stay healthy. But, you can still burn fat in a natural way by building muscle. Just having muscle on your body actually burns calories, even when you’re not working out! You will naturally burn an extra 350-500 calories for every ten pounds of lean muscle. So, not only will lifting weights help you stay fit during the pregnancy, it will help you burn fat after. Having muscle on your body will make you stronger, and being stronger just makes everything easier. Lift weights during pregnancy, and it will be easier to do things like walk up stairs, get up off the couch, bend down to grab the laundry, and everything else that suddenly becomes difficult as your tummy grows. The best part about weight training? It’s so much better than cardio! Most doctors recommend some form of light exercise during pregnancy, but there are just those days when we don’t feel like walking on a treadmill or suffering through an even light setting on the elliptical. When you lift weights, though, you can sit down on resistance machines and lift a very light weight. Just take 30 minutes to lift weights three times a week and ditch that treadmill avoidance altogether. This is a guest post by Nadia Jones who blogs at online college about education, college, student, teacher, money saving, movie related topics. You can reach her at nadia.jones5 [at] gmail.com. A few weeks ago I told you that I was going to get P90X and do it. I may not have mentioned it since then, but I have certainly been thinking about it, almost every day, in fact. I’ve also been working hard to get ready for it. Every week I have increased my average workout time by 10-15 minutes, so that this week I am doing 50-60 minute workouts. There has not been a day in the last 2 1/2 weeks that I have not been sore somewhere. Near the beginning of the month, I got so sore from a half-hour cardio workout that I could barely walk up and down the stairs at church two days later! I haven’t been that sore anywhere since. However, I have been mildly sore in various places–legs, abs, arms, shoulders… the soreness just moves, never leaves. And I’m sure it’s only going to get worse starting next Sunday! LOL! I’ve been watching some of the P90X videos to get an idea of what they will be doing, and I have learned some things from them and also from the videos I have been using on ExerciseTV.tv. I noticed that the trainers would do circuits. They would pick 3 or more sets of exercises, and do either so many reps or so many seconds (30, 45, 60, etc) depending on the exercise, and whether it were strength training or aerobic. Well, I decided to apply that to my strength training at the gym. Something else I learned was about working to failure, meaning you lift a weight heavy enough that at either 8-10 reps or 12-15 (depending on whether you want to build bulk or lean muscle respectively), you cannot life it one more time. Then you rest that muscle by doing other exercises, then come back and do it again. This is the machine I was using. So I took those two things to the gym last week. The first exercise I did was the machine bench press . I picked that and two other machines and did 1 set on each machine 3 times. Then I picked 3 more machines and did the same thing, for a total of 9 machines last Thursday. 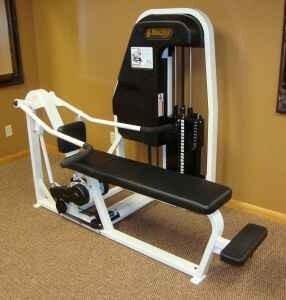 I was able to benchpress only 22 pounds with that machine. Now, not only is 22 pounds a very small amount, but considering that when I started in late May, almost exactly 4 months ago, I started out at barely being able to do the 20-pound minimum, that’s really bad. I mean, gaining only 2 pounds in 4 months… But all summer whenever I would use that machine, I would do as many reps as I could, then rest for a minute, then do as many as I could again (usually about 12-14). Tonight I went again. I started out at 22 pounds, but it was too easy. I got all the way to 15. So on the second round, I put it up to 24. That was still too easy, so I put it up to 26. I should have put it up to 28, because I still got up to 15 reps! So that’s a 4-6 pound gain in just 5 days! I worked the muscle to the max, let it rest, then did it again, and sure enough, I improved! I also improved how much I could do with the bicep curl machine by a couple of pounds, so I was very happy. That’s what P90X seems to be about. Only much more intense! I can’t wait to get started. I’ll keep you all posted, probably with video posts. And I’ll post my modest before and after pictures (no guys except my husband will ever get to see the immodest ones I took yesterday) once I get them taken. And I’ll try to talk about other things on this blog other than just exercise. It’s just on my mind right now. Including my recipe for a homemade recovery drink. I need to actually make it first, though, and see how it turns out, before I post the recipe! So are you planning a workout to get ready for the holidays? Why not share it? Okay, so I know P90X, which I’m going to start next month, is going to be intense. A friend suggested that I warm up to it. I agree. So when I couldn’t go to the gym tonight because my husband was coming home late, I decided to see if there were any free cardio videos online that I could do. Enter ExerciseTV.tv. I browsed through the cardio ones to find one that was half an hour long, and I found this one. Wow! What a workout! I had sweat dripping from all over when I finished–and I don’t sweat easily. I wasn’t able to do it perfectly–the last couple of exercises, which had me in push-up position doing things with my legs, were a bit problematic because of 1) my shoes being too wide in the heels and trying to slip off and 2) my abs not being strong enough. But I’m determined to get stronger. No excuses! What did you do for exercise today, or what do you plan on doing? I’d love to hear it! If you are a mom (and you probably are, if you’re reading this blog), you probably know what Kegals are. If you don’t, go back and click on that link for more details. Because you should know. And if you’re a guy, I suggest you stop reading. Seriously. Well, a couple of months ago I decided to get serious about them. Part of the problem was that I had gotten a Diva cup, and it kept sliding out. Very annoying. So I decided to try doing Kegals to see if it would help. I started out doing 25 or 30 reps, 6 times a day. Every week I would add 5 or 10 reps, until I got to 50. But by that time, the initial enthusiasm I had was waning, and I couldn’t seem to remember to do them. And anyhow, with the tone that I have achieved, I don’t need to do them 6 times a day. But I don’t want to quit, either. My midwife told me that it often helps to associate something else with doing them. She said that one lady would do Kegals every time she stopped at a stoplight. That’s fine if you’re a Soccer mom, but I rarely leave the house, so that wouldn’t work for me. Here’s what works for me. Every time I put my son down for a nap, I have to stand outside the door for a bit to make sure he doesn’t get up. Doing 2-second reps during that time with a 1-second rep in between gives me nearly 2 minutes of time standing there, and I feel like I’m getting something done while waiting to make sure he’s not going to get up. That gets me at least 2 times a day. The other thing that helps is putting Kegals at the top of my daily to-do list. That way when I see the list, I remember them. I may not have time to stop and do them every time, but sometimes I can, and that usually gets me at least 1 or 2 more times. Which is probably more than enough to maintain what I’ve got. That’s what works for me! Here’s how these are going to work. I’m going to report tell how the previous week went and how I met that week’s goals. Then I’ll share my latest weigh-in and post the next week’s goals. Sunday: I think I kind of got off to a bad start. I went out to eat at a Thai buffet and ate too much. Got my first dessert in, also, a delicious coconut milk creation with bits of something yummy in it. Didn’t really exercise either. Monday: I must have really eaten too much yesterday! I wasn’t hungry until almost 9:00 this morning. Usually breakfast is at 8:00. So I didn’t eat until I was hungry. For lunch I hauled out some pizza crust that I had frozen like over half a year ago… it was whole wheat, but made like pie crust, so probably had too much fat in it. I think I ate too much, but I was trying to use it up. It sure was good, though! I got my exercises in late in the day, but I got them in! Tuesday: Something I have learned is that I must have at least one meal that has a good strong protein source. For me, this could be a soy souffle with a whole grain (quinoa, millet, buckwheat, for example) for breakfast, or split pea & barley soup for lunch. At least, I need to do that if I am going to only eat two meals a day. Otherwise by suppertime, I’ve got this craving for something, and then I end up eating too much. That’s what happened today. Breakfast was sweet potatoes and tofu, which on the surface sounds filling, and it was, but the sweet potatoes digest too quickly, and the tofu isn’t as great a protein source as, say, eggs would be. It’s very simple and digests quickly. Fine. But not when lunch is pasta. I ate a handful of walnuts with lunch to try to add in some extra protein, since, thanks to not-buying-so-we-don’t-have-to-take-it-with-us, we have no veggie meats or TVP or anything like that to add to a pasta meal–and beans don’t generally go so well with spaghetti! So by supper time, I was starving. And ate. Too much. Nuff said. Oh, and it rained so I couldn’t get out for a walk. Bummer. Wednesday: I got up late this morning (because hubby slept at the new house and the kids slept in too! ), so I had a bit of a later-than-normal breakfast. Since it was so late, and since the soymilk in the fridge was 6 days old, I had cold cereal (mostly home-made granola) with juice on it. I haven’t done that in years. I added some nuts to increase the protein and fat content, but it wasn’t that filling of a breakfast! So learning my lesson from the day before, I made a pot of lentils, curry flavored, and served them over steamed brown rice. And I ate heartily. No need for supper today! Oh, and I did get my exercises in today. Sure, only one set, not two, but it was late, so at least I did it. Thursday: I definitely got my exercises yesterday! Cleaning the house and hauling heavy appliances made me sore by the next morning, so yes I made it. Read more about that day here. I got my second dessert in today, some coconut custard concoction the lady who made lunch for us cooked up. It was good, but I already have an idea of how to make a vegan version that will taste even better (and actually be healthy enough to eat for breakfast), so watch for that in the near future. Friday: I’m just too tired and sore today to do anything! At least I only got two meals today. Saturday: Today I had a teeny bit for supper (what my daughter didn’t eat of her supper), but I’m glad I did, because I stayed up late packing, and would have probably eaten more later if I hadn’t had a bit for supper. Didn’t get any real exercise in, per se, but I did pack a bunch. Sunday morning weigh-in: Well, no matter how I figured it, I couldn’t get the scales to say less than 141. Which means I lost nothing this week. But actually I think I went up because of Sunday, so I did lose, just you can’t tell. I’m going to have to do better than that if I’m going to make my goals! I probably won’t be able to post anything next Sunday, because I’m going to be at camp meeting. So I’m doing a 2-week goal. I want to lose 3 pounds in the next two weeks. We’re going to be at the new house, and I’m going to be walking up and down the hill or up and down the stairs for 20-30 minutes every day (depending on whether it’s raining or not), so that ought to do something! Plus I don’t have a car anymore, so I won’t be able to go eat out, which will keep me from overeating. Please let me know if you’re joining in the challenge, share your plans and goals, and we’ll encourage each other! See you back in two weeks or less!